Zagreb, summer of 1991. Ten-year-old Ana Jurić is a carefree tomboy who runs the streets of Croatia’s capital with her best friend, Luka, takes care of her baby sister, Rahela, and idolizes her father. But as civil war breaks out across Yugoslavia, soccer games and school lessons are supplanted by sniper fire and air raid drills. When tragedy suddenly strikes, Ana is lost to a world of guerilla warfare and child soldiers; a daring escape plan to America becomes her only chance for survival. Ten years later Ana is a college student in New York. She’s been hiding her past from her boyfriend, her friends, and most especially herself. Haunted by the events that forever changed her family, she returns alone to Croatia, where she must rediscover the place that was once her home and search for the ghosts of those she’s lost. I found Girl at War to be enjoyable, but maybe not as powerful as I was expecting. 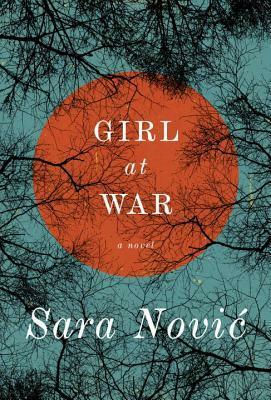 The characters are all pretty much likable, and I really liked the sections of Ana’s childhood back in Zagreb—Nović’s descriptions of how the war effected the Croatian people (especially children) were interesting and kept me turning pages. Ana is about my same age, so several world events mentioned clicked with my memories (I remember there being news reports of war in Yugoslavia in the early 90s, but maybe didn’t understand them so much). The parts in New York (and even some of her return as an adult to Croatia) didn’t work for me quite as well… I could have done without the romance subplot. Nović’s prose has a certain stoicism about it, like Ana’s (and others’) emotions are held at arm’s length. While I did find this voice style purposeful to the story (many war veterans keep their feelings about their experiences at arm’s length), I would have liked a bit more depth and insight into what Ana was thinking and feeling at times. Still, this is a stunning debut, and a quick read that didn’t feel too heavy despite its subject matter. Ana’s harrowing experience in her war-torn homeland will stay with me for a while. I definitely look forward to reading more by Sara Nović in the future. Recommend! Read from June 1 to 6, 2015. This entry was posted in books and tagged contemporary literature, drama, family, female adolescence, fiction, historical fiction, war by kristin @ my little heart melodies. Bookmark the permalink.